Former President Rupiah Banda has commended Malawi for holding democratic and peaceful elections, according to the Malawian News Agency. 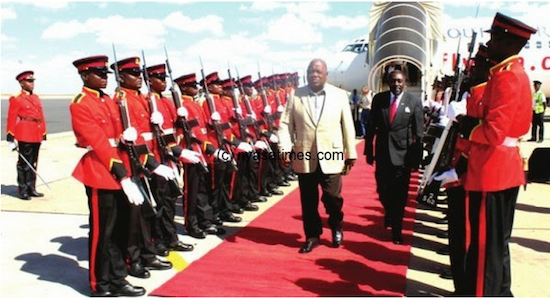 Banda was speaking Thursday on arrival at Kamuzu International Airport in Lilongwe. He said unlike other elections that are associated with chaos, Malawians voted peacefully and remained calm until the time when the results were announced. “I would like to congratulate Malawians for conducting a very peacefully elections and also for maintaining calm for good eight days before the electoral body announced the results. “This is a sign of maturity and Africa as a whole is impressed with how the country conducted its elections,” explained Banda. He then wished President Peter Mutharika good health as he leads the country to greater height. Apart from discussing with Mutharika on a number of issues, Banda disclosed that he also has come to condole the President and his family on the loss of the former Malawi leader the late Professor Bingu wa Mutharika. “After losing the election in Zambia I went to the United States of America at Boston College. Therefore, I did not have time to come to condole the President for the loss of his brother,” he said.